This week I’ve decided to focus on one of my favorite Gradebook tools – Item Analysis. What exactly is Item Analysis? Item Analysis is a tool that allows you to take the pulse of your students. Which problems are they struggling with? Which problems do they have under control? Item Analysis can tell you. Here are the results of an Item Analysis for a recent homework assignment. I can see that my students had a hard time with questions 21 & 29 in Section 7.3. I can use this information during the next class session, reviewing similar problems. You can run an item analysis for any MyMathLab homework assignment or quiz. Start by finding the assignment you want to investigate inside your MML Gradebook. Next to the assignment you will find a little blue box labeled “IA”, as shown below. Click on the box to get started. After each assignment is due, whether it is a quiz or a homework assignment, I run an Item Analysis. 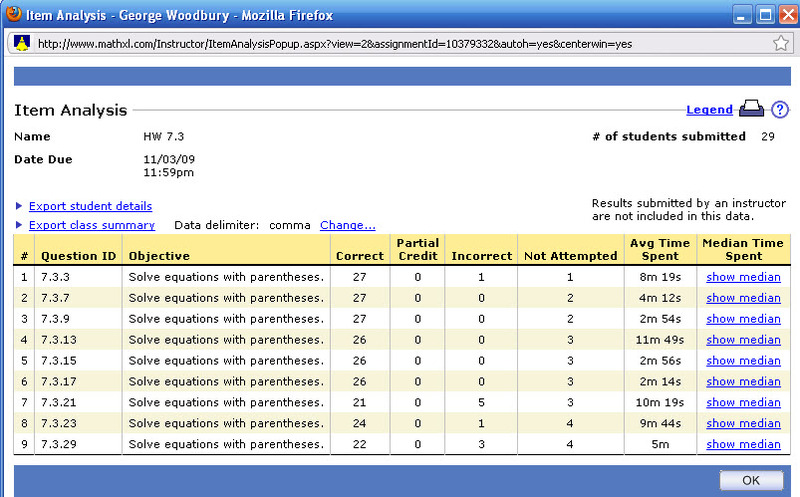 (For the quizzes, I use one attempt per student based on their best score.) For some assignments I will address questions the very next day. For other assignments I will use the information to help form the review session and/or review materials for the upcoming exam. Item Analysis can give you instant feedback concerning the progress of your students. I highly recommend incorporating its use into your overall MyMathLab strategy. If you have any questions on this function or its use, leave me a comment or send me an email. Entry filed under: MyMathLab. Tags: algebra, amatyc, college, developmental math, education, george woodbury, Homework, ictcm, item analysis, Math, math study skills, my math lab, MyMathLab, NADE, Pearson Education, prealgebra, teaching, woodbury. Thanks George … I never even noticed the blue IA next on the screen!